Named for engraver George T. Morgan, the Morgan silver dollar is the most widely-collected silver dollar and is an essential series for any serious coin collector. The Coinage Act of 1873, sometimes called the “Crime of 1873,” discontinued the use of silver in American coinage and ended the “free silver” policy, whereby investors could have their silver bullion minted into currency. Five years later, the Bland-Allison Act brought back silver coinage and mandated that the Treasury purchase two to four million dollars’ worth of silver for the purpose of striking coins. The Morgan silver dollar was the first new silver coin to be created and began production in 1878. Designed by George Morgan, the obverse features an elegant profile bust portrait of Liberty, the motto “E PLURIBUS UNUM,” the year of mintage, and a ring of small stars. The Morgan silver dollar was struck until a silver shortage halted production in 1804. Production resumed in 1921, the same year that the Morgan’s successor, the Peace dollar, was minted. The Morgan silver dollar series is very rich in varieties and errors and was struck at five different locations, so collecting the series is a fun challenge for collectors. 1900 was a decent year for the Morgan silver dollar in terms of mintage. A total of about 25 million dollars were minted across three locations. Philadelphia struck 8,830,000 silver dollars. Examples of this issue are abundant. Tens of thousands of Mint State specimens have been graded by NGC alone. New Orleans struck the most dollars of this year: 12,590,000. Consequently, this issue is readily available even in gem and is considered one of the most common issues for the entire series. San Francisco minted a rather low number of silver dollars in 1900, totaling only 3,540,000. As typical of later Morgan silver dollars made in San Francisco, the strike quality of this issue tends to be somewhat poor. The most notable variety of the 1900 Morgan is the O/CC repunched mint mark. It would seem that an old Carson City die was repurposed into a New Orleans die, an interesting decision considering that Carson City had not minted Morgans for seven years at this point. This variety is desired by collectors of the series and can bring some very nice premiums in higher Mint State grades. Part of the reason that Morgan silver dollars are so popular among collectors is the publicity they received in the mid-to-late twentieth century due to examples flooding the market decades after mintage. At the time of their creation, the Morgan silver dollar was mainly at the service of silver investors. The average citizen had little need for a silver dollar, so the demand lied almost entirely upon the silver market. As a result, many Morgan silver dollars were not released into circulation after they were produced but were instead left in storage at the Mint. 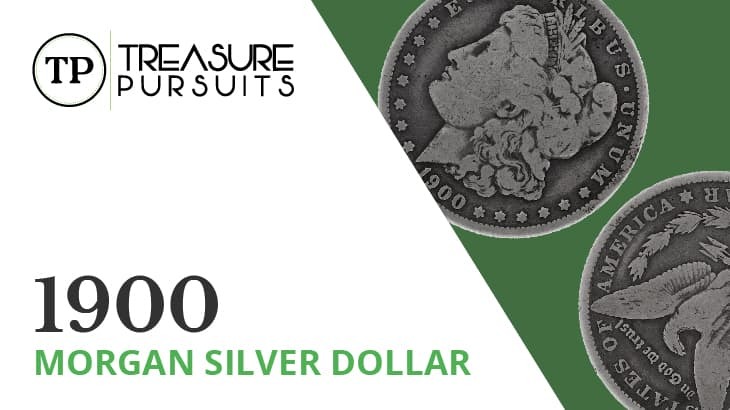 In the mid-twentieth century, these treasure troves of Morgan silver dollars were rediscovered and eventually released to the public in several “hoards.” In the 1970s and 80s, even more were released by the government and by private estates like that of Lavere Redfield. With the advent of these releases, the Morgan silver dollar, especially Carson City issues, became much more common, and the doors were opened for collectors of all kinds to have access to this unique coin. The melt value is the minimum value for a 1900 Morgan silver dollar. The current melt value for this coin is approximately $11.32. However, these coins are almost always worth more to a collector than to a metal dealer. Philadelphia and New Orleans issues from this year are worth about the same in most cases: $19 in Good-4, $24 in Very Good-8, $29 in Fine-12, $35 in Very Fine-20, $37 in Extremely Fine-40, $40 in About Uncirculated-50, and $49 in Uncirculated MS-60. MS-65 examples carry a value of $200, and proof strikes may be worth as much as $2,903. San Francisco mintages are higher in value, especially in Mint State. This issue is worth $23 in Good-4, $28 in Very Good-8, $34 in Fine-12, $38 in Very Fine-20, and $47 in Extremely Fine-40. The value increases to $92 in About Uncirculated-50, $309 in Uncirculated MS-60, and $2,000 in Uncirculated MS-65. The O/CC variety is the most valuable coin from this issue and carries values of $44 in Good-4, $49 in Very Good-8, $53 in Fine-12, $62 in Very Fine-20, $108 in Extremely Fine-40, $170 in About Uncirculated-50, and $335 in Uncirculated MS-60. MS-65 specimens of this variety command $2,250, MS-66 specimens command $5,850, and MS-67 specimens carry the impressive premium of $45,000!